There's more of a story here, isn't there? Fill in the… - You don't know me. "Merry christmas, keep your legs closed and stop giving us away mom! With Love, daughter #7." Fires *and* painful deaths! That's just the sort of thing I love! Congregation sends calling card for church-goer who passes wind during sermon. Also, who hasn't done the grape in the microwave experiment? Whenever I'm bored, alone and have grapes to spare, a few go in the microwave. I've had a number of results, from ones that sizzle and jump about, to grapes that just go on fire, and ones that just sizzle. *stare * Have you seriously!?! You mean to say you haven't? I think my house would explode!!! That's the kinda luck I've got anyway. LOL!!!! That's hysterical. I love it. Wha..what...what the hell? 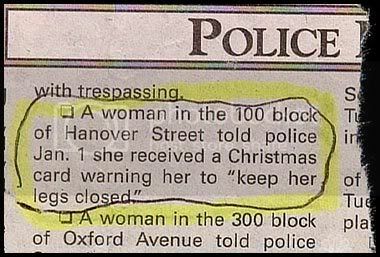 They must have been having a sloooow day in the police blotter. I totally love it when I get mentioned on other peoples' blogs, especially when it isn't because they want me to stop stalking them or give back all the stuff I stole from them or whatever. No, I stolle from you in this circumstance. ;) hehe. I've stolen from you before and forgotten to credit. Sorry 'bout those. Depends if it's from the things I've obtained recently or not, because my memory isn't so good. i showed this video to some of my friends at school today, and we decided to ask our science teacher if she would let us try it. we showed her the video, and right before he puts the glass over the grape she starting saying "no! no! no! bad idea! bad idea!" and told us to get out of her classroom. needless to say, she's not going to let us use her microwave.